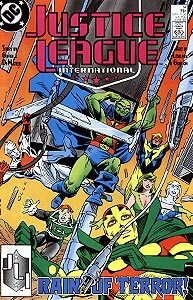 Cover Description: Components of an alien structure reign down on (clockwise from left) Captain Atom, Martian Manhunter, Booster Gold, Green Flame, Ice Maiden II, Mister Miracle I, and Guy Gardner. Brief Synopsis: The JLI responds to an alien assault despite a pronounced weakening of their ranks. FIRST APPEARANCE: First appearance of Lord Manga Khan, an intergalactic merchant/pirate who will be a thorn in the side of the League for years to come. FIRST APPEARANCE: First appearance of L-Ron, Manga Khan's assistant. L-Ron's future is more closely tied to the League than even that of Manga Khan. 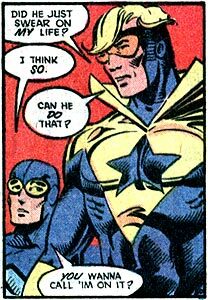 Booster laments that Green Flame and Ice Maiden, both of whom he apparently met for the first time off-panel, will not be joining him when he meets Mister Miracle's wife, Big Barda. Similarly, Booster's first meeting with Big Barda will take place off-panel before page 15 of this issue. Beetle indicates that Mister Miracle's home is in "Mt. Kisco." This is presumably Mount Kisco, New York, approximately a 1-hour drive from Manhattan. Mount Kisco was the birthplace of Olympian Bruce Jenner, ex-Disney Chairman Michael Eisner, and actor John Schneider, who played the father of Superman on television's Smallville. ...the names of Cluster agents Captain Krikk and Commander Sooloo. These two characters are named after the characters James Kirk and Hikaru Sulu, who held the ranks of Captain and Commander respectively at the end of the spin-off motion picture Star Trek IV: the Voyage Home, released in 1986. Booster joins Beetle and Miracle at Miracle's suburban home to watch an American football game. Booster hasn't learned from future mistakes and has bet Beetle $20 on the outcome of the game. It's a bet that Booster is in progress of losing when they are interrupted by an alien invasion. Martian Manhunter comments that Black Canary is missing. This is the first issue to take place after the traumatic events causing Black Canary to lose her sonic "Canary Cry" in the Green Arrow: Longbow Hunters mini-series. She will not be heard from again until Justice League International #19, when she will officially resign from the League. Though it is not shown on-panel, Green Flame and Ice Maiden II will clearly be granted "provisional" status between now and next issue. They will become the 31st and 32nd members of the Justice League. They are the 4th and 5th members to join since Booster joined the League. Boosterrific Review: This is not the best work of writing team Keith Giffen and J.M. DeMatteis. For the first time in the series, the jokes frequently feel a little forced as the team presents for the first time a truly comical (and I don't mean that in a good way) villain in the Cluster. Truly missed is the artwork of Kevin Maguire, as the looser style of fill-in artist Steve Leialoha fails to provide the realistic grounding and solid characterization that typically ground the series' humor. It was not that bad-I actually liked how the Blue and Gold invaded Scott Free's home.